Several of the recipes that I have posted recently were included in my meal plan for Johnny Moneyseed's $75/week food budget challenge. Since you have all been so excited about them (seriously, you've been REALLY excited about these recipes! 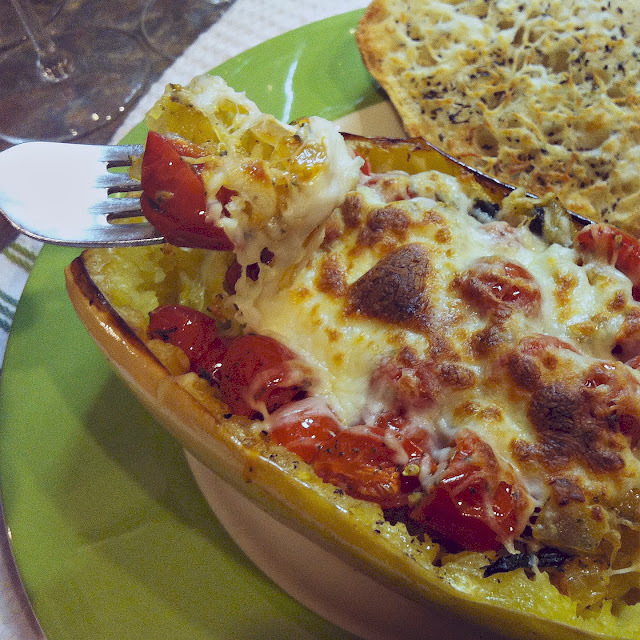 ), here is another one for you: Tomato & Mozzarella Roasted Spaghetti Squash. This is one of those delicious meatless dinners that are so filling and hearty that you pretty much forget there is no meat involved. Even Alex didn't complain about the lack of meat here. I also made some homemade garlic toast to serve along with it, which probably helped. This dinner is pretty easy to put together too. Spaghetti squash is roasted until tender and then shredded into spaghetti-like strands and topped with a simple saute of tomatoes, onions, and garlic. 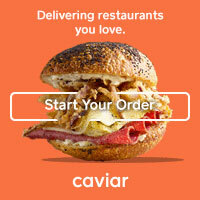 Sprinkle on some mozzarella cheese, bake until brown and bubbly, and that's dinner! I like the how it looks to serve these right inside the squash halves-- like a natural bowl. You could always roast the squash, scoop out the flesh and continue the preparation in a baking dish instead to serve this more casserole-style. This is a great vegetarian entree, but would also be a delicious side dish for grilled chicken or pork chops too. Preheat oven to 375 degrees. Using a large knife, carefully slice off the stem end of the squash. Follow by cutting the squash in half lengthwise. With a large spoon, gently scoop out the seeds and membranes from the inside of each squash half until the surface is clean and all seeds are removed. Brush the cut sides of each squash using 1 Tbs. of olive oil. Season to taste with salt and pepper. Place each squash half cut side down on an aluminum foil-lined baking sheet (preferably one that is rimmed). 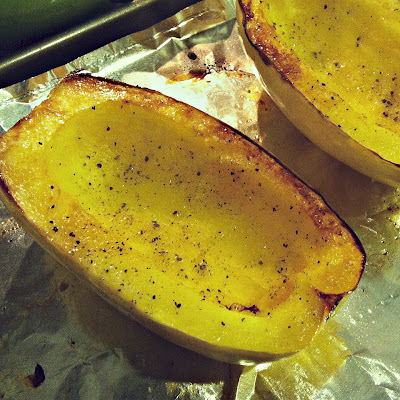 Bake at 375 degrees for 30-35 minutes or until you can easily pierce the skin of the squash with a fork or toothpick. Remove from oven and allow the squash to cool. Heat the remaining 1 Tbs. olive oil in a medium skillet over medium heat. Add onions and saute for 4-5 minutes or until the onions begin to soften. Stir in garlic and cook for an additional 2 minutes, stirring constantly. Add tomatoes and cook for another 5 minutes, stirring occasionally. Remove from heat and stir in basil, parsley, and salt and pepper to taste. Once the squash is cool enough to handle, use a fork to shred the meat of the squash. It should come apart easily into shreds and resemble spaghetti noodles. Evenly distribute the squash shreds around the inside of each squash "shell." 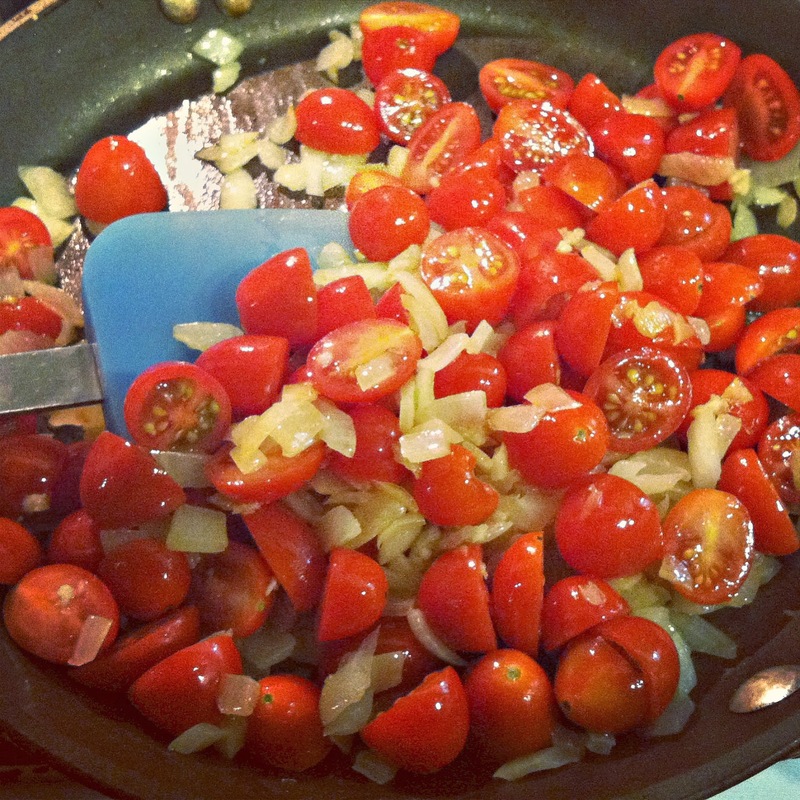 Pour half of the tomato and onion mixture into each squash half and spread out to even thickness. Top each with the shredded cheese and bake (cut side up this time) for 8-10 minutes until cheese is melted. Optional end step: To get the cheese browned and bubbly, I cooked the squash halves under the broiler for an addition 2-3 minutes. Look delicious! 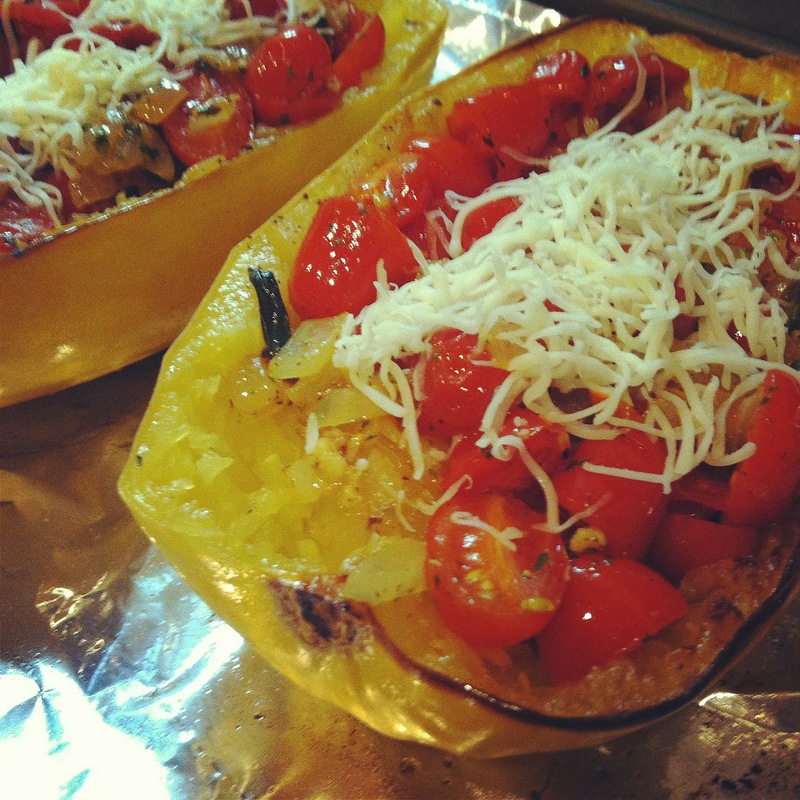 I'm always looking for new ways to make spaghetti squash. Me too, Danelle! And I love the way it looks served right in the squash skin too.